Tests have confirmed that three people recently died from bird flu, a top Azerbaijani health official said Monday. Deputy Health Minister Abbas Velibeyov told The Associated Press that tests conducted by the World Health Organization had confirmed the diagnosis of avian influenza in the deaths of three people, who all came from the same district on the ex-Soviet nation's Caspian Sea coast, south of the capital, Baku. Velibeyov said that names and ages of the victims would be released on Tuesday. Also Monday, Myanmar reported its first case of the deadly H5N1 strain, and there was a high risk poultry in Afghanistan were also infected, officials said a day after the virus gained new ground in Europe and Africa. The virus was discovered in wild birds in Azerbaijan last month in an area along the Caspian Sea coast and has spread to the northeast and the southwest near the border with Iran. The deaths are the first reported cases in humans in the country. Azerbaijan shares a short border with Turkey, where four children died recently of the disease. Bird flu has killed at least 98 people in Asia and Turkey since 2003, according to the World Health Organization. Almost all of the human deaths have been linked to contact with infected poultry, but experts fear H5N1 could mutate into a form that spreads easily among people, sparking a human flu pandemic. Authorities in Poland on Sunday announced confirmation of the country's fourth case of deadly avian flu. Laboratory tests confirmed the H5N1 strain in a dead swan found in a town near the border with Germany, said Tadeusz Wijaszka, head of the laboratory in Pulawy, central Poland. Two wild swans in Greece tested positive for the deadly H5N1 strain, the Agriculture Ministry said Sunday, bringing to 32 the number of bird flu infections found in birds in Greece since the first case was confirmed Feb. 11. The number of wild birds found infected with H5N1 bird flu in Germany is approaching 200, authorities said Monday, after the confirmation of several new cases. A federal laboratory said the strain has been found in 192 wild birds, most of them near Germany's Baltic Sea coast. Three cats and a stone marten also have been diagnosed with the strain. The laboratory also said six ducklings found dead at a farm in Bavaria tested negative for the virus, relieving fears that H5N1 had reached farm birds in the country for the first time. A racing pigeon association urged authorities Monday not to cull the country's 800,000 racing pigeons, arguing that the birds were not carriers of the deadly H5N1 strain of the flu virus. "Racing pigeons have a strict diet and are vaccinated against all diseases," said a statement from the Union of Federations of Romanian Pigeon Enthusiasts. There are about 6,000 breeders in Romania; they have 800,000 pigeons which take part in national and international competitions. A new IMF report says a bird flu pandemic similar to the 1918 outbreak that killed more than 40 million could result in a "sharp but only temporary decline" in the world's economic activity. The report, released Monday, studied the possible financial and economic impact on the world should a bird flu pandemic erupt. Lab tests confirmed the outbreak in northern Myanmar after 112 chickens died, said Laurence Gleeson, a senior official at the U.N. Food and Agriculture Organization, citing a report from the Myanmar government. The Cameroon government announced its first case on Sunday, becoming the fourth African country to be struck by the virus. The H5N1 bird flu strain was detected in a duck on a farm close to the northern town of Maroua, near the border with neighboring Nigeria, the government said in a statement broadcast on state radio. In Afghanistan, meanwhile, the U.N. Food and Agriculture Organization said that an H5 subtype of bird flu was found in poultry samples in Kabul and Jalalabad, and that there was a "high risk" further tests could prove the samples to be the H5N1 strain. The deadly bird flu virus has not yet reached Afghanistan, but the FAO warned last month that it would and chided the government and donor nations for being slow to prevent it. Dr. Azizullah Esmoni, of the Afghan Agriculture Ministry, said he expected further results within 48 hours to determine whether the H5N1 virus had struck the Afghan poultry. The H5N1 strain of bird flu has killed or forced the slaughter of tens of millions of chickens and ducks across Asia since 2003, and recently spread to Europe, Africa and the Middle East. Health officials fear H5N1 could evolve into a virus that can be transmitted easily between people and become a global pandemic. That has not happened yet, but at least 97 people have died from the disease worldwide, two-thirds of them in Indonesia and Vietnam, according to figures by the World Health Organization. There was no evidence of human infection in Myanmar, said Than Tun, director of the country's livestock breeding and veterinary department, a division of the Agriculture Ministry. "We are taking all measures to control the situation," he told The Associated Press, pledging that authorities would deal with the outbreak in a "transparent manner." Than Tun said the remaining chickens in the flock of nearly 800 were immediately slaughtered, and that experts were inspecting farms within a two-mile radius of the farm where the infected birds were found. The cases were detected at four farms north of Mandalay, the country's second largest city, said Jum Conix, a WHO spokesman in Myanmar. Myanmar's military government — which generally restricts the free flow of information and exercises tight control over the mostly state-owned mass media — had previously said it would deal openly with any outbreaks of bird flu. Gleeson said that testing was carried out at laboratories in Mandalay and Yangon, the capital, where technicians had received training in how to detect bird flu from the Food and Agriculture Organization and other international agencies. "We have every reason to expect there is sufficient competence (in Myanmar) to make the diagnosis," Gleeson said. "If the government says they've got it, then they've got it." Samples have also been sent to a laboratory in Australia, according to Than Tun, but Gleeson said the FAO had not been informed of that. The World Health Organization was waiting for confirmation from the Australian tests before officially declaring an outbreak in Myanmar, said Jum Conix. Cameroon's Minister of Livestock Aboubakary Sarki told reporters the infected duck was among 10 birds that died in Maroua from Feb. 12-26. He said the government had already slaughtered birds in the area as a precaution, but did not say how many. 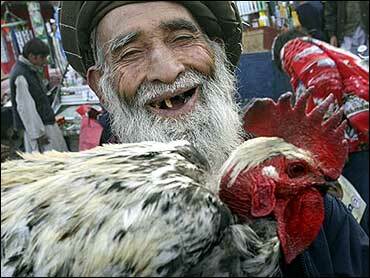 The fatal virus was first discovered in Africa on a commercial poultry farm in Nigeria in February. It has since been reported in Niger and Egypt.